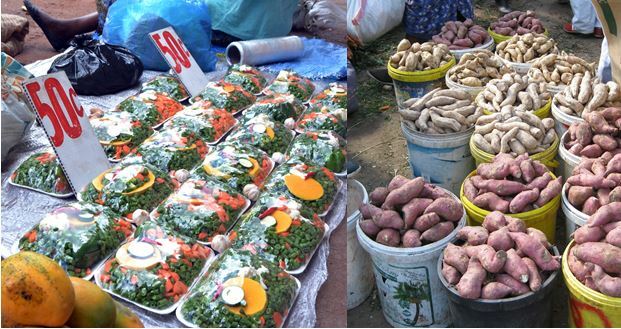 When consumers can no longer do without cassava, nsima/sadza, matoke, tomato, beans, peas, among other foods, it could be an indication that the consumers have become addicted. Such addictive tendencies may have little to do with the food being a staple or a necessity. The way profit-oriented seed companies and manufacturers promote their seeds or finished products in most developing countries is designed to encourage such addiction. There is a narrow distinction between tastes & preferences and addiction. A community is most likely to be addicted to a commodity that it ranks more highly as a necessity. It is not about income but the fact that people can no longer do without the particular food. In addition, commodities around which communities have become addicted within clusters of consumers become necessities which they cannot live without. Such commodities also become price inelastic. Any percentage increase in the price of the commodity will not translate to a greater decrease in demand because the commodity has become a staple. Cost will not affect consumption because each household or community already eats a given volume or quantity. In the same vein, a percentage decrease in price will not result in more percentage increase in supply or consumption. For instance, a decrease in the price of maize meal will not cause consumers to eat more nsima/sadza merely because it has become cheaper. The longer the period people are exposed to certain food baskets, the more tastes and preferences are developed and embedded. The body adjusts and makes the food part of its system. To the extent the body can no longer do without a certain food like nsima/sadza, it becomes addicted to that food. Staple commodities often have clearly defined demand patterns in terms of volume. Any surplus over the defined demand is a waste. This is where gathering evidence becomes critical in terms of showing each commodity’s demand patterns and extent to which such a commodity has become a staple within each consumer class. Such evidence will prevent cases where surplus food goes to waste but open avenues for value addition and exporting. Addictive food clusters need to be known because they also define food baskets for various niche market. Demand does not fluctuate so much irrespective of price. People will not eat more commodities because there is a new state of the art market. Investors and policy makers need to know these issues at a granular level because they influence potential investments. Such insights also reveal the stability of demand for particular commodities as well as stability of Return on Investment (ROI). Contrary to the way policy makers in developing countries try to characterize and quantify the Poverty Datum Line, for instance US$600.00 per household, it is a myth to try and have one food basket for the entire nation. Different grassroots communities have their own addictive food components which they demand most of the time. For instance, people in high production zones may have their own food baskets in which addictive elements may constitute 70% of the food basket. Anything that comes from outside becomes a luxury which they can do without. While addictive tendencies tend to be more visible on the demand side, the same patterns apply on the supply side. For instance, key determinants that drive food production include knowledge and skills among food producers, available resources and climatic conditions. How these factors are used determines over-production or under-production. However, as farmers continue to produce over many years, their practices stop being about skills, resources, knowledge or climatic conditions but passion turned into addiction to particular practices. That is why it is difficult to wean some farmers from cotton production, coffee production, cocoa production, tomato production, maize production and tobacco production, among other commodities they have become addicted to producing. To what extent are agricultural production practices being promoted in developing countries determined by farmers’ addiction to certain crops, livestock and other related production practices? What capacity is within the addicted farmers? How are farmers under-utilizing or over-utilizing their capacity? To what extent has agricultural knowledge in developing countries become locked in addictive tendencies along agricultural value chains? In some areas, specific commodities like maize no longer do well but farmers continue producing because they have become addicted to the knowledge associated with maize production so much that it is now difficult to unlearn and create space for new knowledge related to new crops and livestock. Examples of addictive processes including farming as a business and farm field school. There is also a bandwagon effect in production where some farmers just copy and imitate others quietly. Besides surprising the market, bandwagon producers disrupt the passion-driven producers. Some production and consumption patterns were largely influenced by colonialism. For instance, in Zimbabwe, the Land Apportionment Act of 1923 laid down the foundation of production practices by demarcating land according to natural regions, soils and land sizes, among other factors. Knowledge for producing specific commodities like sugarcane, flowers, tea, coffee and tobacco became concentrated in areas where these commodities were said to be ideal. Knowledge about livestock production became concentrated in Matebeleland while cotton production knowledge was more in Gokwe and Muzarabani, among other dry regions. On the other hand, by producing and consuming maize, communities became addicted to maize. However, production was also driven by directives where those with resources influenced the production of particular commodities like cotton, tobacco, sugar cane, coffee, maize, beef cattle, flowers, etc. This also became addictive from a skills perspective. That is why trying to change farmers’ mindsets has become a decades old challenge. Most farmers have also become trapped in debt cycles through addiction to contract farming models. Even if they may have their own resources, many farmers cannot imagine achieving meaningful yields without a contract company. Another increasingly powerful addiction is to ICTs, especially mobile platforms like WhatsApp. Many young farmers no longer want to think for themselves or digest information before forwarding it around. More time is spent on mobile phones than on productive pursuits. This entry was posted in Agricultural Intelligence, Agricultural Markets, eMKambo, www.grmining.co.zw. Bookmark the permalink.